With Ramada shortly coming to an end, if you haven’t already you must visit our top Iftar pick before it closes for the year. 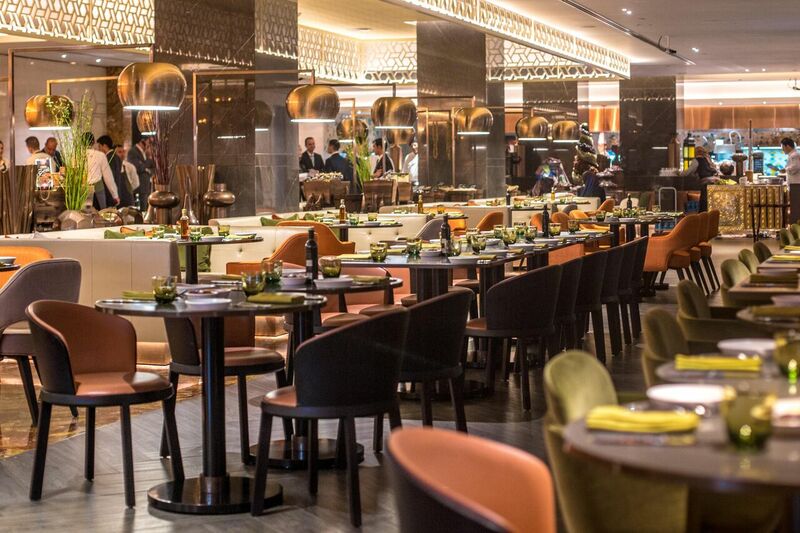 Olea at Kempinski Mall of the Emirates is our highlighted Iftar this Ramadan for its incredible cuisine, relaxed, fun-filled atmosphere and enviable location. We popped along so that we could bring you a first-hand account of just what makes this particular Iftar our favourite this year. Found inside the opulent Kempinski Hotel at Mall of the Emirates, you can pop in for Iftar after you’ve finished your shopping, although make sure you book in advance such is the popularity of this authentic evening. Whisked up from the lofty marble lobby adorned with oversized chandeliers and that Swarovski crystal entrance, you’re greeted by friendly faces happy to guide you to your table in the bustling open plan restaurant. Arrive by 7pm to make the most of everything on offer for even before the sun has set the queues at the buffet have started to snake their way from salad bar to mixed grills. Dates are placed on the table for the breaking of the fast and all your other dishes are meticulously selected from an extensive buffet that covers entrees, main courses and mouth-wateringly good deserts. The atmosphere is lively without being obtrusive, large groups of friends sit alongside families with small children and the odd husband and wife duo thrown into the mix, looking for a true taste of Arabia. Groups stand around and mingle until the time of tucking in and animated chatter fills the distinctly cosmopolitan air. This is not a place to necessarily go all out on your outfit but an effort is clearly appreciated by the number of well-healed guests complementing each other on their attire du jour. The décor in the main restaurant is modern and moody with lashings of dark wood, tarnished gold and splashed with vibrant burnt orange and buttery suede furnishings. It’s comfortable chic, with tables dotted around the space to give both privacy and involvement in the action (aka speed of getting to the buffet). So let’s talk about the food. The chefs at Olea are actually from the Levant region which makes them extremely knowledgable and passionate about the cuisine that they prepare, all of which is beautifully presented. Their rich Levantine dishes, coupled with the famous hospitality adds to the festive atmosphere. Pile your plate high with labneh, fatoush and tabbouleh alongside freshly made Arabic pitta and flatbreads created in front of your eyes before being lovingly dipped in creamy humus. The main part of the buffet is an extensive selection of meats and fish with lamb kebabs, koftas, shish tawook and grilled prawns reigning supreme. Pile your plate high with tumeric rice and regional vegetables for a true Levant feast. If you leave a little time between courses, the desert room is well worth a visit. You’ll find gems such as Mesabbak and baklava which are delightful and our plates were full of fresh fruits and sticky, sweet treats. There is even a chocolate fountain for those that prefer chocolate, where you can twirl marshmallows, jelly sweets and juicy grapes under the dripping goodness until your heart’s (or stomach) is content. After Iftar retreat to the Ramadan tent on the terrace, a strikingly fresh space adorned with sparkling chandeliers and pretty furniture that makes a perfect place to sit back and relax in good company. For the sheer uncomplicated nature of Olea alongside the traditional cooking and relaxed atmosphere,we couldn’t recommend an evening here more. It’s home cooking at its best. Olea offers both Iftar and Suhour.